Recently we have published a CPU cooler comparison with many coolers. Today, there is an overview with selected coolers from Arctic, Cooler Master, Cryorig, Enermax, Intel, Scythe and Thermaltake, tested on an Intel Core i5 system in the second part of the cooler chart. So you can easily find the right air cooler or AIO water cooler for your AMD PC or Intel PC and get a quick comparison of the cooler test results. Temperatures are read with the Core Temp 1.0 RC6 and Asus AiSuite II Tools. The program Prime95 get the processor load up to approx. 100%. 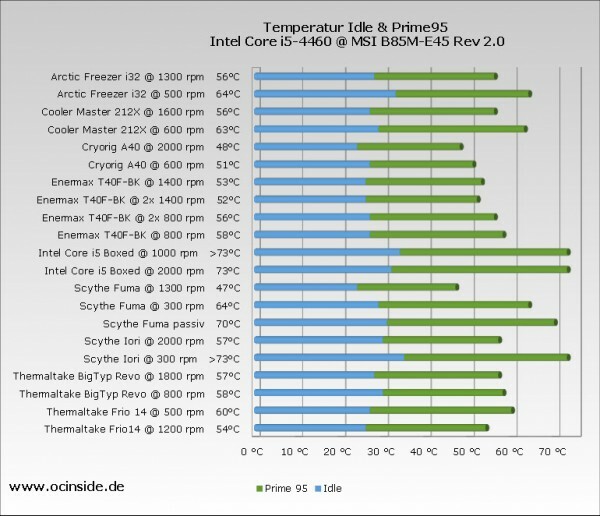 Measurements are always the peak temperature of the CPU, which is the highest temperature that the processor in the test reached with in the small-FFTs test of Prime95. The below listed coolers are tested on the same system, so their results are therefore well comparable. But the results are not comparable with the test results from the first part of the CPU cooler comparison 2016, because they are tested with an Intel Core i7 PC, and not with the Intel Core i5 system. The ambient temperature was approx. 20°C. 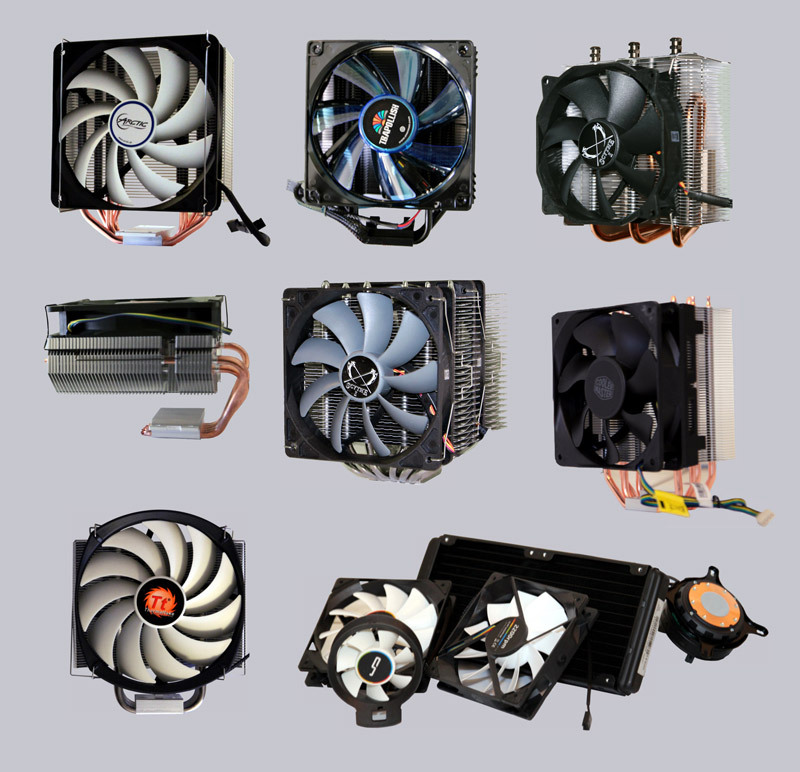 The coolers are tested with different fan speeds and were equipped with different available number of fans (if available). The boxed Intel Core i5 cooler, Arctic Freezer i32, Cooler Master 212X, Enermax T40F-BK, Scythe Fuma, Scythe Iori, Thermaltake BigTyp Revo and Thermaltake Frio 14 are conventional air coolers. The Cryorig A40 is a ready filled all-in-one water cooler – so called AIO cooler – with integrated water pump and radiator. 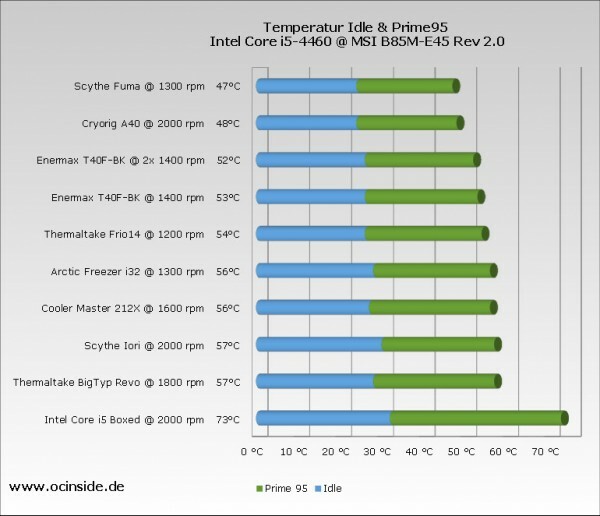 All tested heat sink fan combinations are listed in the following bar chart and divided into two measurements: Idle (blue) and Prime95 with 100% CPU load (green). Here you can easily see the different distributions of the cooling results, e.g. 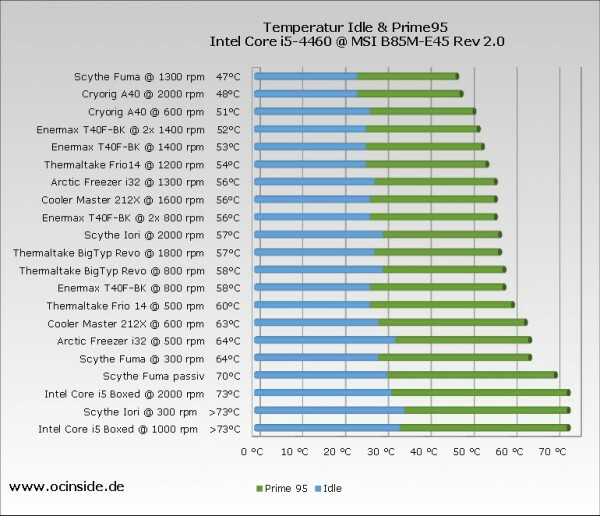 the very high idle temperature of the boxed cooler, but also the differences of the Prime95 results at low fan speed in comparison to full fan speed. One can also listen to each fan sound volume on the last page of each detailed review. 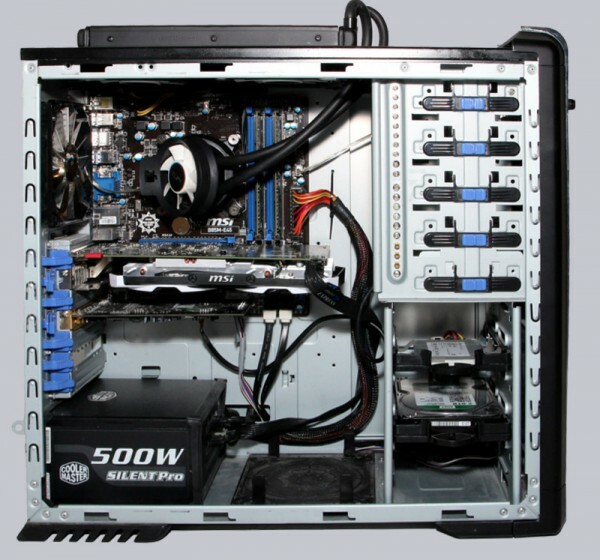 Mostly with different fan speeds, because an increased fan speed not only increases the cooling capacity, but unfortunately increases also the fan noise. Clicking on the respective cooler leads to the selected cooler review result with a summary of the overall impression, installation, price, and with a CPU cooler sound sample. The CPU cooler reviews are each several pages long and also can be found in the Hardware Review section at Cooler reviews. Additionally, there is the well known OCinside.de interactive fit for fan guide with direct cooler sound to determine which CPU cooler fits on which motherboard and how much space is available after installation for the remaining components like e.g. RAM or graphics card. Hint: With our interactive Fit for Fan guide you can virtually fit each cooler onto different motherboards – missing coolers will be added with the regular updates. Here’s the previous Intel Core i7 CPU cooler chart 2016 and here’s our older CPU cooler chart before 2016 – a direct comparison to these cooler charts results is not possible, because the test systems have changed fundamentally. Here you can buy CPU coolers.